ROGERS: I can remember a time when we would be out and people would stare at you, you know. I wouldn’t be aware of it because I can’t see, but Bev would tell me about–people look at you like you were some kind of a sideshow. NARR: Mike Rodgers cannot see, but he plays the blues harmonica with a passion that lights up the room. He and his harmonica have opened for acts like The Eagles and Emmy Lou Harris. Rogers once made his living teaching remedial English, but began losing his sight in his thirties to retinitus pigmentosa. By the time he was forty, his sight was gone, and he had to find a new career. ROGERS: After I left my job it was very scary for a while there, but gradually, once you get over the fear, and you have to say to yourself “Well, this is the way it is, and it’s not going to change. Your sight’s not going to come back, so you just have to make up your mind that you have to find other things to fill your life. NARR: At first there were not very many choices. ROGERS: When I first retired, the state of Maine, for example didn’t do a whole lot with people who were visually impaired, as far as rehabilitation, because there were some people who worked–they had these stands, like a concession stand in government buildings where they sold sandwiches and cigarettes, and whatever, you know. So there were certain amount of people that did that some of the older people who were blind were actually living at the Maine Center for the Blind in Portland, and they did chair caning, which I learned to do by going up there and studying. They also–they made brooms. The women did sewing. They made vests and they made some other things; bags and stuff. And that’s pretty much what was going on at that time. Fortunately–I learned to do chair caning, I did can chairs for many years, but you know it’s not really, its not a money-making craft. NARR: Rogers turned to music. ROGERS: I was given a harmonica when I was fifteen. This was like a Christmas gift, and I learned to play it just for my own amazement for years, and by chance one of the teachers that I worked with was a musician and he was doing a concert at school and just by chance I played with him at the concert, just for fun and it led to a whole new career for me. When you play the harmonica, you’ve got it in your mouth anyway, so I never really considered losing my sight as being a big problem for my music. What was harder was the fact that I became dependent on other people to get me here and there and even in clubs, you know I had to have assistance, and the clubs are all very hard to get around in and stuff. NARR: Some are harder than others. ROGERS: The other day I was playing an outdoor concert and they had a temporary stage set up, and in order to get on the stage, you had to climb up three steps of a step ladder and step over onto the stage, so I had somebody hold the ladder for me and somebody grabbed my hand when I got–to get on it. That’s when you realize, you know–plus my age. I’ll be seventy-four in a couple of weeks and along with my sight, I just have to be very careful. NARR: And while the Americans with Disabilities Act has made some things easier, there are some things Rogers has worked out on his own. ROGERS: There’s things you have to do for yourself, you know, the ADA act is wonderful thing, but at the same time, if you have disabilities, you’ve got to use your head and figure out ways to get around certain issues. NARR: During the 1980’s Rogers served on two task forces focusing on rights for the visually impaired. One of them was led by State Senator Walter Hitchins, of Eliot. ROGERS: He was involved in getting the voter law changed so that blind people and people who were visually impaired could actually go into the voting booth with somebody of their own choosing. Because before that, you had to go into the booth with an official from the town you were in. So they knew how you were voting, you know. And in order to get privacy he worked to get this law through in the state that you could go into the booth with a person of your own choosing, which I thought was a big thing. And he also worked to protect blind people from being physically assaulted. He was instrumental in helping change the law that way. 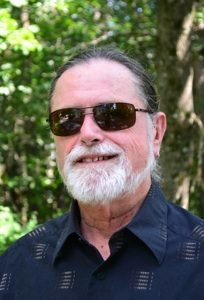 NARR: For a time, Rogers lived in Georgia, working with Very Special Arts, teaching young musicians with disabilities how to play the harmonica. It was a lesson in finding their own unique skills. ROGERS: Everybody has something special that they can develop, and you may not know what it is when you’re young, but you have to be on the alert for it and when you find it, work it. NARR: When the ADA became law, Rogers began noticing the changes, but he says the transition was gradual. ROGERS: Nothing was immediate when it went through, I don’t think. The changes kind of came gradually, begin to see ramps, begin to see Braille on things, you know–see things that made it easier to get around. I noticed in public buildings, you know, there would be a lot of easy access ramps and that–especially in newer buildings, but know know I find even today it seems to me there are a lot of older buildings that are very hard to get in and out of for people with disabilities. NARR: In addition to the changes in the physical world around him, Rogers senses a change in attitude toward persons with disabilities as well. But whether it’s the physical environment or changing attitudes, Rogers views the efforts toward disability rights with a certain amount of patience. ROGERS: I think that the ADA, it’s a wonderful act, and I think its’ a process, you know, I think that as time goes on more and more things will be done to make the playing field equal for people with disabilities. It’s a big area. It’s like any other big area, you know, It just takes a lot of time. Changes don’t come overnight. NARR: I’m Keith Ludden. Our series on the twenty-fifth anniversary of the Americans with Disabilities Act is funded in part by the Maine Humanities Council in partnership with Oral History and Folklife Research, Alpha One Independent living center, WMPG, and the Disability Rights Center of Maine.